As more and more Somalis, the majority of them women and children, continue to flee the famine in their homeland, United Nations agencies are ramping up efforts to meet the rising humanitarian needs, especially nutrition for the youngest among them. The number of Somali refugees arriving in the three Dadaab refugee camps in Kenya has increased to an average of almost 1,500 in the first four days of August, up from 1,300 a day in July, according to the UN High Commissioner for Refugees (UNHCR). So far this year some 116,000 Somali refugees have arrived in Dadaab – about 76,000 of them in the last two months alone, the agency noted. Some 80 per cent of the arrivals are women and children. When they arrive at the camps, they receive a 21-day food ration from the UN World Food Programme (WFP), plastic sheets, cooking utensils, jerry cans, blankets, sleeping mats and soap. The UN Children’s Fund (UNICEF) is scaling up its activities to assist refugees in Dadaab and surrounding host communities, delivering life-saving support in health and nutrition, water, sanitation and hygiene and child protection. The agency is also working with local health authorities to set up a therapeutic feeding centre in the border community of Liboi to ensure that families crossing into Kenya have access to life-saving health and nutrition services as quickly as possible. “Many Somali families who cross into Kenya at Liboi do not realize they must walk another 100 kilometres before arriving at the refugee camps in Dadaab,” says Olivia Yambi, UNICEF Kenya Representative. “The health of some malnourished children crossing at Liboi is so precarious that they simply cannot wait until they get to Dadaab for treatment. UNICEF is also working to ensure access to clean water and sanitation for the refugees, as well as planning to construct 146 new learning centres/classrooms in the camps to accommodate newly-arrived refugees and alleviate congestion in pre-existing schools. Meanwhile, UNHCR said its humanitarian airlift to Somalia – the first in more than five years – is set to begin early next week. The first of three planned flights is scheduled to land in Mogadishu on Monday, bringing more than 31 tons of shelter material and other aid items from the agency’s stockpile in Dubai for displaced Somalis living in the capital. 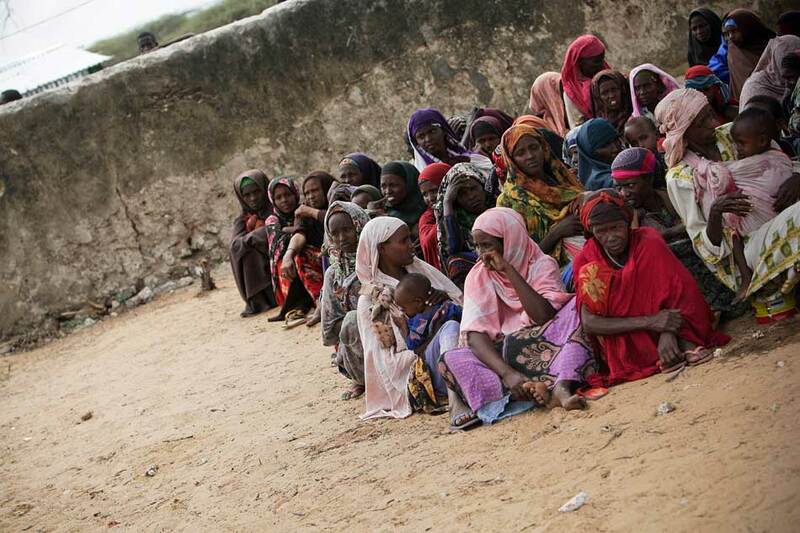 “We estimate that some 100,000 Somalis, driven by drought and famine, have reached Mogadishu area over the past two months alone in search of food, water, shelter and other assistance,” UNHCR spokesperson Andrej Mahecic told reporters in Geneva. On Wednesday the UN declared a famine in three more areas in drought-ravaged Somalia, bringing to five the number of regions in the Horn of Africa country where acute malnutrition and starvation have already claimed the lives of tens of thousands of people. The Afgoye corridor outside Mogadishu, the capital itself, and the Middle Shabelle region are now in a state of famine in addition to the previously declared Lower Shabelle and southern Bakool region. As famine threatens to engulf the whole of Somalia’s south, the UN Food and Agriculture Organization (FAO) warned today that immediate action is needed to save the lives and livelihoods of millions of farmers and pastoralists across the drought-stricken Horn of Africa. Among the short-term measures the agency is seeking to employ are the distribution of seeds and tools for the October planting season, support to animal health, and food-for-work programmes. FAO added that famine is expected to spread across all regions of the south in the coming four to six weeks and is likely to persist until at least December 2011.